When I was in school, we used to have the equivalent of a class bake sale, where we would set up stalls either individually or with friends in our lunch room and sell snacks cooked by our parents. Kids from other classes would buy the snacks during the lunch break and the money collected would be used by us to either buy some equipment or do some improvements in the class. It was our first experience with commerce! Every year that we did the sale, my mother would make sabudana vada – fried sago patties served with sauce or a coriander-yoghurt chutney. Similar to the sabudana khichadi, the sago is soaked and then drained by wrapping it in a tea towel. The sago is then mixed with boiled and mashed potato, roasted peanuts, chilli powder, fresh coriander, salt and sugar. You mash it all together, make small rounds and fry them. And they taste amazing! A crispy texture on the outside contrasts a soft and crunchy texture inside, because of the peanuts. Which then meets the simple yet delicious flavour combination of coriander, red chilli powder, salt and sugar. She would bring the sago mixture to school and fry them fresh in the school kitchen to serve them piping hot. That’s how they are meant to be eaten and given how delicious they taste, it’s no surprise that we would always sell out! Few people outside Mumbai have tried this snack and I always make it a point to serve it when people come home for dinner. My friends in Singapore are pleasantly surprised at having a savoury sago snack, given most of the sago they consume is typically in a dessert. 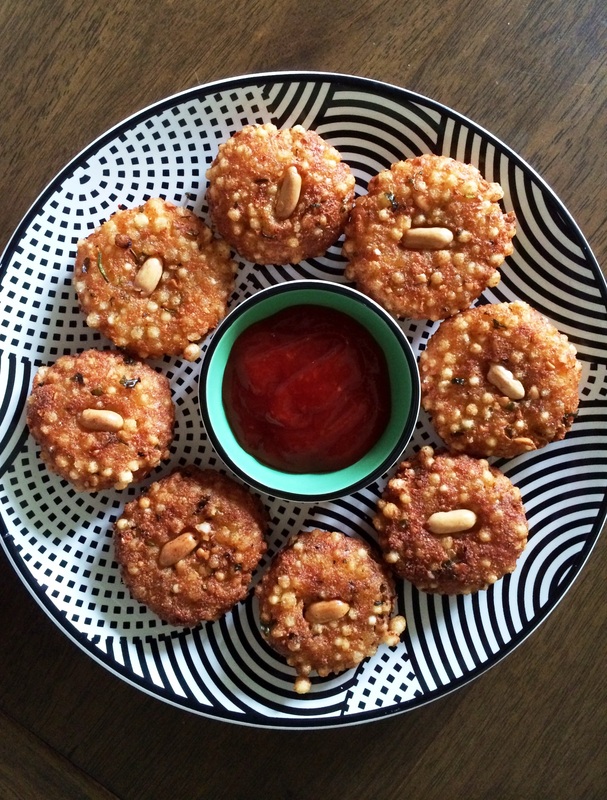 This entry was posted in Marathi cuisine and tagged sabudana vada, sago, snacks. Bookmark the permalink.